Globally 2.4 billion people lack access to basic sanitation services. According to WaterAid, 774 million Indians lack access to adequate sanitation, 76 million lack access to safe drinking water and 1.4 million children die every year because of unsafe sanitation and water. A report by the Ministry of Urban Affairs on public toilets mentions lack of adequate number of public toilets, lack of proper maintenance, vandalism, broken fittings, improper lighting and lack of water supply and ventilation as key challenges to public toilets. 23.5 million people (34% of total slum population) in Indian slums do not have access to toilets at home. 18% do not have shower facility and 25% do not have tapped water connection at their residence. Even though 15% of the slum population in India relies on public or community toilets to meet their daily sanitation needs, only 8% of the government managed public toilets and 17% of privately run toilets are clean. This leads to people practicing Open Defecation (OD). Women feel unsafe going out in the open in dark hours to relieve themselves. They face harassment and humiliation. GARV Toilets is social enterprise that provides Smart Sanitation Solutions to underserved communities in urban and peri-urban areas in developing countries. We provide integrated water, sanitation and hygiene (WASH) facilities through our Smart Sanitation Hubs. These hubs house our smart toilets, bath facilities, drinking water facility, laundry services and a business kiosk where basic health and hygiene products can be sold. GARV’s Smart steel toilets are portable, durable and maintained through automation. The steel structure and fittings ensure that the toilets are not vandalised. The Smart Technology used in our toilets, differentiates us from our competitors. IoT sensors collect data on usage, toilet functioning and user hygiene behaviour. 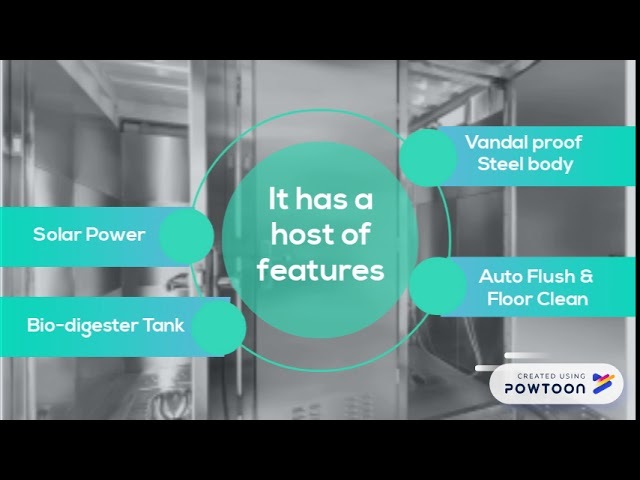 It also activates auto flushing and floor cleaning depending on malodour percentage. Data can be visualised on a web-based dashboard which can be accessed by concerned stakeholders. Our partner NGOs can monitor the effectiveness of awareness campaigns by monitoring the hygiene behaviour of the communities. The sensors help us to reduce operational costs and keep the toilets clean and well-maintained. Unlike traditional brick and mortar constructions, our prefabricated, modular solutions are easy to install and reduces construction time by 92%. We rely on solar energy to power our toilets and bio-digesters enable onsite faecal sludge management enabling us to cut carbon emissions. Toilets for women have Menstrual Hygiene Management units installed in them. GARV provides clean well-maintained sanitation services to underserved urban communities. As of today, we provide clean, well maintained services to 300,000 people every day. Through our interventions we want to make a positive impact in creating healthy communities. To learn more about us please visit our website www.garvtoilets.com.